CNN's Nick Paton Walsh is in Colombia, at the Venezuela border, where protesters lit a bus on fire in a tense standoff with the Venezuelan National Guard. At the call of opposition leader and the nation's self-declared interim president, Juan Guaido, foreign aid has been shipped to Venezuela in response to worsening food and medicine shortages. Maduro, who has been in a standoff with Guaido for the presidency, denies that a humanitarian crisis exists in Venezuela and suggests that aid efforts are part of a US plot to orchestrate a coup. Trucks carrying supplies were blocked at most spots Saturday. 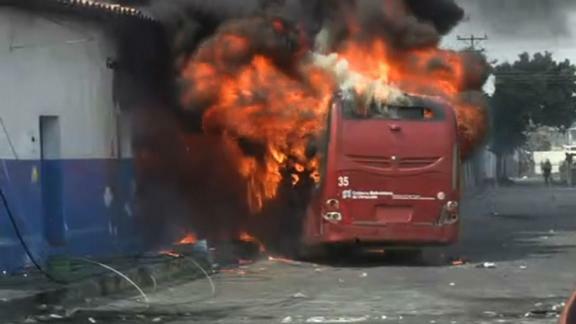 Witnesses said two trucks were set ablaze while attempting to cross into Venezuela from Colombia. Witnesses who spoke to CNN said the trucks went up in flames as Venezuelan troops loyal to Maduro prevented the vehicles from crossing the border. CNN cannot independently confirm the incident or the circumstances of how the two trucks were set on fire. National Assembly Representative and Guaido supporter Adriana Pichardo told CNN that at least five people were also killed in clashes with Venezuelan security forces on Saturday. CNN cannot independently confirm the number of fatalities. In a series of tweets Saturday, Pompeo condemned the actions of Maduro's government and said the US would "take action against those who oppose the peaceful restoration of democracy in Venezuela." He blamed "Maduro's thugs" for attacks on civilians, accused "Cuban agents" of directing the attacks and praised opposition leader Guaido -- recognized by 50 nations including the US as Venezuela's interim president -- for leading the effort to allow the aid through. "While Interim President Juan Guaido builds distribution networks for humanitarian assistance, Maduro blocks its entry and sends armed criminal gangs to attack the innocent civilians accompanying the convoys," Pompeo said in a statement Saturday. "Tomorrow is a new day," he continued. "Now is the time to act in support of democracy, and respond to the needs of the desperate Venezuelan people. The United States will take action against and hold accountable those who oppose the peaceful restoration of democracy in Venezuela," he said. On Monday, US Vice President Mike Pence will travel to Colombia to address a meeting of the Lima Group -- made up of leaders mostly from Latin American countries. The White House said Pence would "voice the United States' unwavering support for interim President Juan Guaido and highlight the Venezuelan people's fight for democracy over dictatorship." A White House official said Saturday that Pence will meet with Guaido on Monday in Bogota, during Pence's visit to Colombia. "Today #MaduroRegime killed unarmed citizens of their own country to keep food & medicine from entering. They celebrated murder & burning of trucks carrying aid as a victory. The world & those inside #Venezuela will reflect on what happened today & it will give rise to action," he tweeted. Former President Bill Clinton also took to social media to condemn the regime. "The heartbreaking violence in Venezuela must stop. I stand with President @JGuaido, the National Assembly, and the people of #Venezuela as they embrace their right to live in peace, choose their leaders, and decide their future, in harmony with their neighbors," Clinton wrote on Twitter. Senator and Democratic presidential candidate Bernie Sanders tweeted: "The people of Venezuela are enduring a serious humanitarian crisis. The European Union issued a statement saying the regime's refusal to recognize the humanitarian emergency was escalating tensions. "There are worrying reports of unrest, acts of violence and a growing number of victims, in particular in the border areas and among the Pemon indigenous community," it said. The EU reiterated a "call for the restoration of democracy through free, transparent and credible presidential elections." The Colombian foreign minister said 285 people were hurt, with 37 requiring hospitalization, after the Venezuelan National Guard fired tear gas and rubber bullets at protesters near the Colombian border Saturday. The protesters chanted, "We want to work!" as the national guard fired tear gas to disperse them. Men with shirts covering their faces started throwing rocks toward the guard members. CNN's team in Ureña witnessed Venezuelan armed forces fire tear gas at three members of the opposition-leaning National Assembly while they were attempting a peaceful mediation with protesters. Bogota on Saturday night said all border crossings between Colombia and Venezuela would be closed Sunday and Monday so that authorities could evaluate damage to infrastructure it said had been caused by the Maduro regime. Maduro declared Venezuela's borders with Brazil and Colombia closed, citing threats to security and sovereignty. On Saturday he told supporters he was breaking all diplomatic relations with Colombia and calling for its ambassadors and consuls to leave Venezuela. "My patience has run out. I can't continue to tolerate the aggressions against Venezuela that are being carried out by the Colombian government," Maduro said. He also threatened the United States: "If the empire dares to attack, they will be received by the strength of the Venezuelan armed forces." Guaido spoke at a joint press conference with President Ivan Duque of Colombia in Cucuta, Colombia, on Saturday night and urged people not to be loyal to those that burn medicine in front of the sick. "Today the world has seen the tyranny that we struggle with in Venezuela. People celebrated that hospitals could not get access to the aid," Guaido said. Humanitarian aid moved through the Brazilian-Venezuelan border in Pacaraima, according to Maria Teresa Belandria, Venezuela's opposition-appointed ambassador to Brazil. ¿Quiénes son los 'otros' candidatos presidenciales en Venezuela?